The Galaxy Note 8 can now be bought for under Rs 44,000 on Amazon India. Read to know if the Samsung phablet is worth buying or not. E-commerce giant Amazon is offering Samsung's flagship phablet Galaxy Note8 at the lowest price in India. 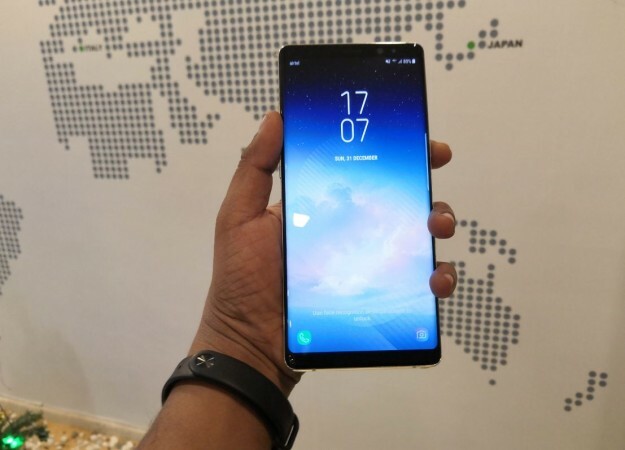 Samsung Galaxy Note8 made its official debut in India late 2017 and was one of the most talked-about mobile phones in the market. Back then, it came with a launch price of Rs 67,900 and to be fair, it was worth every penny. We had the opportunity to review the device for more than a month and, I have to say, the Samsung phablet aced in almost all aspects – premium build quality, super powerful and faster processor, exceptional camera hardware, day-long battery, best display and most importantly, S Pen makes the Galaxy Note8 standout among rivals. S Pen makes for one of the most valued additions to the Samsung phone. The tool offers natural brush stroke features, S Memo, GIF animations with Smart Select, Air Command functions, Magnify and Translate. With the new unified app Samsung Notes, S Pen allows users to jot down handwritten notes, draw, or edit memos from one location. Also, the Screen off memo feature lets the user take up to one-hundred pages of notes as soon as you remove the S Pen, pin notes to the Always On Display and make edits directly from the Always On Display. Even today, Galaxy Note8 is still as relevant and competitive with the current crop of flagship phones as it was in late 2017. And thanks to Amazon India, it can now be bought for as low as Rs 43,900 via exchange deal. This a smart deal for anyone looking to buy a flagship for, under Rs 50,000. For those unaware, Samsung Galaxy Note8 flaunts a gorgeous 6.3-inch super AMOLED screen with Infinity Display feature, that makes the screen cover more than 75 percent of the front-panel offering rich viewing experience while also improving exterior looks by several notches when compared to the previous generation model. Inside, it houses a Qualcomm Snapdragon 835 octa-core/Samsung Exynos 8895 octa-core (depending on the region of sale), 6GB RAM, 64GB/128GB/256GB storage and a 3,300mAh battery with fast wire/wireless charging capabilities. It recently received Android Oreo update. As far as the photography is concerned, Galaxy Note 8 comes with top-of-the-line camera hardware. It houses dual-camera system, one 12 MP primary camera (Wide-angle lens with f/1.7 aperture and dual-pixel autofocus) and a 12 MP Telephoto camera (f/2.4 aperture and 2x Optical Zoom) with OIS (Optical Image Stabilisation), and on the fronts, it features an equally impressive wide-angle 8MP snapper with f/1.7 aperture. More sensitive, more brush features, S Memo, GIF animations with Smart Select, Air Command functions, Magnify, Translate, Samsung Notes, a new unified app allowing users to jot down handwritten notes, draw, or edit memos from one location, Screen off memo allows you to take up to one-hundred pages of notes as soon as you remove the S Pen, pin notes to the Always On Display and make edits directly from the Always On Display. Follow us @IBTimesIN_Tech on Twitter for latest updates on Samsung.